Originally in : Asimov’s Science Fiction, October 1993. Sensitive story about longevity and the effect of wider generation gaps. A centenerian (and more) is visited by his grandchildren. Originally in : Omni, January 1993. The tables have been turned on the British Empire, with the U.K. little more than an Industrial Archaelogy Theme Park. An Indian film-crew are shooting a number of films on location. Nancy Kress. Dancing on Air. Bioenhanced ballet dancers and a dog with the mind of a five-year old child. Don Webb. A visit to the Farside. Originally in : Amazing Stories, April 1993. An Alternate Future History – the Cold War and the Space Race continued, with the Soviets finishing on top. A Romeo/Juliet scenario is acted out with a similarly tragic ending. One of a number of recently-arrived aliens settles in a remote Appalachian community and attempts to set up an illicit still. Connie Willis. Death on the Nile. SF? Horror? Crime? Fantasy? Agatha Christie? All of these, and more. 1994 Hugo, Best Short Story. Brian W. Aldiss. Friendship Bridge. Burnell, attempting to recover from having significant portions of his memory stolen (in FOAM) finds himself in Turkmenistan on the track of one portion. G. David Nordley. Into the Miranda Rift. Originally in : Analog Science Fiction and Fact, July 1993. Hard SF at its best (ie some interpersonal conflicts etc.). A team of explorers are in the subterranean (sub-Mirandan?) caves of Miranda, a Uranian moon. A ‘quake seals them in, leaving a difficult journey to the surface. Mike Resnick. Mwalimu in the Squared Circle. Originally in : Asimov’s Science Fiction, March 1993. Alternate History, with Tanzanian President Nyerere taking up Amin’s offer of settling their war in the boxing ring. Robert Reed. The Guest of Honor. Deep-space explorers, made up of an amalgam of minds, return to have their lives terminated and their memories returned to the original owners. Pat Cadigan. Love Toys of the Gods. Originally in : Interzone, December 1993. Deep in the steamy nano-engineered rainforest, a drug has been developed with allows DIY neurosurgery, enabling radical genetic self-modification. Charles Sheffield. Georgia on my Mind. Parts of Babbage’s Difference Machine turn up in New Zealand, as do pointers to a discovery made in the previous century. 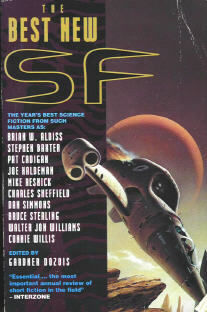 1994 Hugo, Best Novelette. Cush is the Second Coming, and takes on all the sins of the world, becoming in the process …. Mark Rich. On the Collection of Humans. Originally in : Nova 5. Short advice for collectors thereof. Steven Utley. There and Then. A scientific research station in the pre-history of the Earth faces the prospect of future abuse of this opportunity by Big Business. Jack Cady. The Night We Buried Road Dog. Supernatural story about cars and the long-dead twin who became Road Dog. An artist specialising in painting in tandem with non-artists. Far Future. A young girl is bio-engineered to grow extremely rapidly and to take a key role in understanding the Sun. The USA is struggling with a population hooked on drugs which allow perfect recall of past events. William Browning Spencer. A Child’s Christmas in Florida. A family celebrate Christmas Day in a somehwat off-beat way. Maureen F. McHugh and David B. Kisor. Whispers. Originally in : Asimov’s Science Fiction, April 1993. A new virus is spreading across the globe. Most victims die, but some appear to be somewhat different after contracting it. Walter Jon Williams. Wall, Stone, Craft. Alternate History. Rather aimless and rambling story involving Mary and Percy Bysse Shelley and other bods shortly after the Battle of Waterloo.